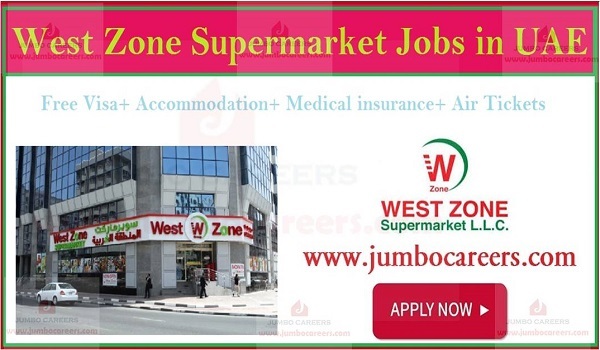 Leading supermarket chain in UAE: Westzone Supermarket hiring supermarket staff for Dubai & Sharjah branches in 2019. Its a free and direct recruitment by the company. * Butchers must have good sounds of knowledge in the same field. Acceptable Filipino, Indian and Nepalese nationals only. * Bakers must have related experience. Preferably Filipino, Indian and Nepalese nationals only. * PRO required with a minimum number of 25 projects completed with DM. Knowledge of Arabic is necessary. Preferably male gender only. * Supermarket Assistant Manager must be graduate with 2 years of UAE experience as an assistant manager. * Supermarket Manager must be graduate along with 5 to 7 years of similar UAE work experience and having a super ability in handling the entire branch. * Rest of jobs would be fulfilled with similar qualification and experience.